Restore lost volume to your facial appearance for a more youthful look when deep folds and wrinkles have formed around your nose and mouth areas. Juvéderm Vollure XC is an injectable dermal filler to reduce moderate to severe nasolabial wrinkles and folds. Juvéderm Vollure filler was FDA-approved in 2017, and has been in use in Europe since 2013. The signs of aging in this nasolabial area are often referred to as parentheses lines, laugh lines, and marionette or sad lines. These folds and wrinkles in the skin develop over time as a result of aging, a loss of your natural hyaluronic acid and collagen, and repeated facial movements that are a part of everyday life. Juvéderm Vollure XC filler is a hyaluronic acid dermal gel that is appropriate for people who are over 21 years old. Not only does this product effectively smoothen lines and wrinkles, but those results can also last for up to 18 months with optimal treatment, making Juvéderm Vollure XC the longest-lasting injectable filler on the market right now. This treatment is marketed by the globally known brand, Allergan—the same brand that created other top-notch facial dermal fillers such as Juvéderm and Voluma. Studies performed with patients who received Juvéderm Vollure XC filler injections showed that 59% of them noted a visible improvement in nasolabial lines and folds. Eighty-two percent of them were still satisfied with their results at the six-month mark, and 68% continued to be pleased at eighteen months. Allergan formulated Juvéderm Vollure XC using its advanced Vycross technology that places together differing molecular weights of hyaluronic acid, adding to the gel’s effective longevity and an especially smooth result. The cross-linking used with Vycross also makes the face fillers suppler and easier to inject. 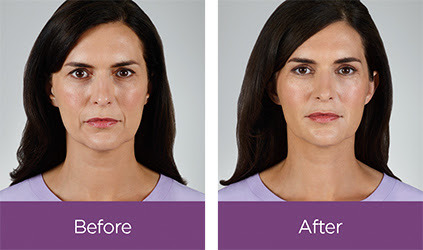 This same technology was utilized in making Juvéderm Voluma XC, another popular product from Allergan’s line of face dermal fillers, to successfully increase volume in facial cheeks. Vycross also contributes to lessened side effects when using Juvéderm Vollure XC filler. Patients experience less swelling at the Vollure Juvéderm injection site because this technology decreases the attraction of excess water to the area. Vollure Juvéderm filler is directly injected into the facial tissue where wrinkles and folds exist. There is a numbing agent, lidocaine, contained in the formula to help eliminate any discomfort during this quick face fillers injection procedure. Some of the more common side effects that may be experienced with Vollure Juvéderm filler include some initial swelling or redness and a small risk of bruising. Side effects, if any, usually subside completely within a week or less. Juvéderm Vollure XC dermal fillers are excellent face fillers for smoothing those static lines that are visible around the nose and mouth even when your face is at rest. To learn more about Vollure Juvéderm filler and to hear about our special offer this month, please call Dr. Tang at 408-740-5320 to schedule your appointment.